The viral image conjured a nation of tears. Research on grief explains why. The image of the late President George H.W. 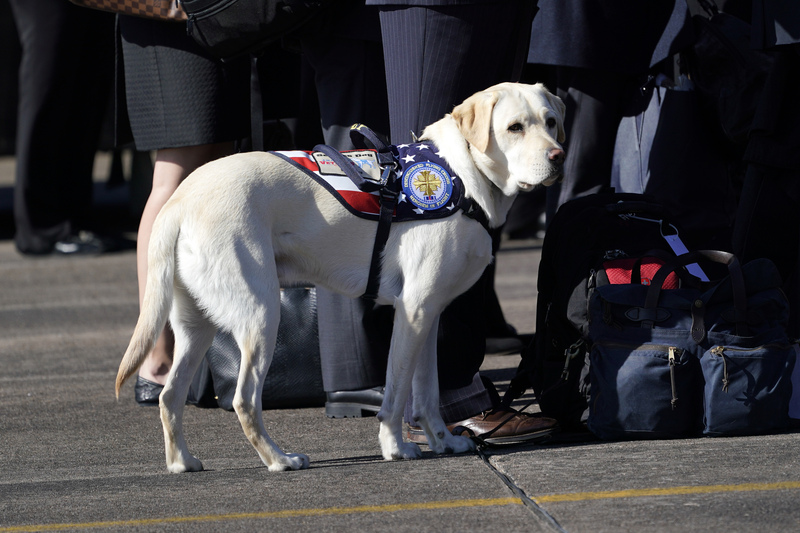 Bush’s service dog, Sully, laying beside the 41st Commander-in-Chief’s casket with the caption, “Mission Accomplished,” continues to go viral because it taps into our collective pathos for pet loss. “This is a heartbreaking photo… Animals feel our loss in their lives just as much or even more than we [do]. They are family,” one Twitter user wrote. Witnessing the sorrow in Sully’s crestfallen face triggered our national grief because science shows that our love for our four-legged friends — and their love for us — is profound. We often attach to our pet pals as deeply as we do to each other, and research bears out that many of us view them as kin. A study in Science shows that the bonding hormone oxytocin surges when we gaze into our pets’ eyes, solidifying our attachments. “It’s the same thing that happens between parents and children,” says Cori Bussolari, Psy.D., an associate professor at the University of San Francisco and licensed psychologist who studies the effects of pet loss on humans. Findings as far back as 2003 have shown that pet grief is a potential area of clinical concern. Last year, a report in the New England Journal of Medicine showed that a 61-year-old-woman’s dog loss catalyzed symptoms of a heart attack, and she needed to be stabilized by an angiotensin-converting–enzyme inhibitor (to relax blood vessels) and a beta-blocker (to regulate heartbeat). Science suggests that it cuts both ways. Barbara J. King, a emerita professor of anthropology at the College of William and Mary, who wrote How Animals Grieve, agrees. Many of us have heard anecdotes of a dogs or cats who’ve refused to leave the grave, bedside, or front door of the house of a deceased owner. (A study in 2016 even observed elephants mourning the loss of one of their own.) So, Sully’s sad face does, in fact, represent genuine sorrow. To help a bereft animal cope, hang on to a piece of clothing (a sweatshirt, for example) that belonged to the deceased. Because animals have such an acute sense of smell, keeping a garment around that retains the scent of its owner will be soothing to them, Bussolari says. If the pet, like Sully, will be adopted into a new family, it’s especially important to give them something that contains the distinct odor of their lost loved one. Also, try not to disrupt their daily habits: “Ritual, just like with people, is a big deal to animals. So if they are walked or fed or played with at a certain time every day, stick to that pattern,” Bussolari says.